Another attempt to keep a diary! 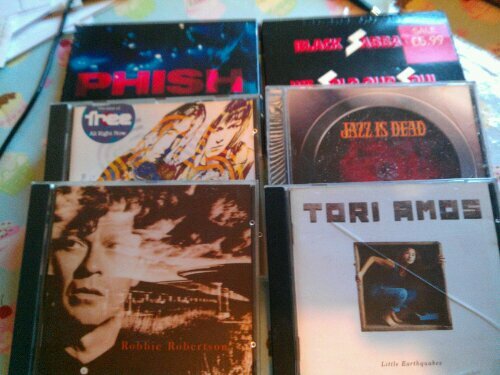 Eclectic collection of CDs to listen to in the car! So having not got home till 2am I was looking forward to an early night tonight but it was not to be. Sarah’s ligament had swolen up again like it did a year ago and she could barely walk. We ended up at the out of hours doctors at the hospital where we had to wait well past out 11 o’clock appointment time with some fine examples of local pond life! When we got called before they did I could almost feel the daggers burning into the back of my neck. Sarah ended up with a pair of crutches which she struggled to get to the car with. I was seriously worried as the car was very low on fuel and had we ran out she’d have never made it back!! This entry was posted in Uncategorized by bloke2012. Bookmark the permalink.